The third edition of Namma Bengaluru Awards-2011 were presented to various citizens for their exemplary work at a sparkling ceremony in Basavanagudi National College Grounds on April 7, 2012. Out of 14,000 pre-nominations and 47 final nominations under 6 categories, the Namma Bengaluru Foundation awarded 8 winners. Each award carried a cash prize of Rs.1 lakh and memento. Award winners with jury members and guests. Uday Vijayan of Beyond Carlton receiving the award under Citizens Category. U. V Singh, Indian Forest Services officer for Public Official category-Group A.
Kalaa Devrajan on behalf of Karunashraya under Groups and Organizations-Group A. Group B of the Groups and Organizations category, Team of Solid Waste Management Roundtable. MLA- Krishna Byre Gowda under elected representative category. Registrar of Lokayukta, B.Yoginath on behalf of Lokayukta Special Court Judge N K Sudhindra Rao for both awards. Also, starting with this year, a new category- ‘Bengalurean of the Year’ was conceived and Lokayukta Special Court Judge N K Sudhindra Rao was awarded under this. Also, Lokayukta office received the award under Public Institution category. Registrar of Lokayukta, Yoginath received the award on behalf of Rao. Uday Vijayan, received the award under Citizens Category. Spearheading Beyond Carlton he has been instrumental in taking initiative to create awareness around fire safety. After receiving the award Vijayan was thankful and mentioned that the organisation was born out of tragedy after losing his son, and attributes that anger, grief and loss as the driving force. He adds,"at the outset I am totally overwhelmed and humbled by this award. Personally the award is very special because it’s a recognition from Bangalore’s citizens, which means a lot. SAAHAS, an NGO was awarded under Social Entrepreneurs category. 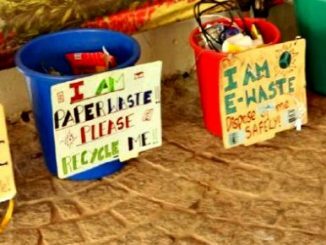 It continues to work on zero waste management in Bangalore . Wilma Rodrigues, co-founder received the award. U V Singh of the Indian Forest Service received the award in Public Official category. He has been in the service for about 25 years and recognised for his remarkable work and anti-corruption approach. Proudly he said, "I dedicate this award to some of the officers who have laid down their life while fighting corruption. I will donate the prize money for the future of the the martyr’s children." Under the same category in group B, BBMP pourakarmika- Lakshmamma received the award for relentless work to keep her area clean. She was nominated from Vinobhanagar, Siddaiah road. Under the category Groups and Organisations, Karunashraya received the award. The organisation works hard to take care of cancer patients. Kala Devarajan, Treasurer, of the trust was present to receive the award. Group B of the same category, Solid Waste Management Roundtable received the award. The team works in educating citizens on managing waste at the source, recycling and even composting the waste. The free of cost programme is even endorsed by Bruhat Bangalore Mahanagara Palike (BBMP), Karnataka State Pollution Control Board (KSPCB) amongst others. Last but not the least, MLA Krishna Byre Gowda (Congress, Byatarayanapura constituency) received the award under elected representative category. Overwhelmed with the award he says, "It’s rare that a politician receives these kind of awards opposite to the reputation we carry among masses. But I would like to mention that there are some decent people left in politics who want to work towards society." The families of Rifleman K S Ravindra who was killed in J&K and BSF Constable Bheema Shankar Hadapad, who lost his life to naxals in Chattisgarh were among those honoured at a Vijay Diwas ceremony on December 16th.